Whatever it is that bothers you or brings you joy, frustrates you or astounds you; what is always the same? What is the constant? Your job is giving you headaches, so you work at fixing it. Your relationship is giving you great happiness, so you work at making sure it stays stable. Someone cuts you off on the freeway so you flip them off. You really like a certain prepared salad from your local deli so you talk to the manager to ensure a steady supply. All of these things “out there” bringing happiness and pain, and they are virtually infinite – there’s always a new detail. How can you deal with an infinite sequence of issues? It’s all about you. At the center of all these details is the one that perceives them. If you try to resolve your issues one at a time, you’ll never finish. So, how about clarifying the one element that is the constant in all your situations? Look directly at “you” and see clearly what it is that is reacting to all these external happenings. What would be better – fixing all the details one by one, or changing the way you perceive them all at once? 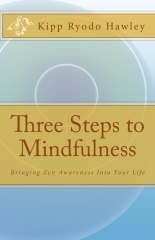 After a certain period of practicing mindfulness we begin to understand that it is a cycle. At first, we may believe that being mindful is like getting into a pool of awareness – you get there and stay there. But we find ourselves straying outside that pool almost immediately, and inevitably we get frustrated because we’re unable to keep ourselves there. Straying out of the pool of awareness is not a problem, but rather the natural order. We need to process the new things we’ve perceived. The problem is when we find ourselves in Storyland and get stuck there, mulling over our narratives, instead of continuing through the cycle and returning to awareness. Once we’ve become comfortable with the cyclical nature of mindfulness we can move into the next phase of practice – increasing our mindfulness “resolution”. When you buy a new digital camera you find that it has more megapixels than your previous one. This make it “hi-res” – the pixels are so small that from your normal viewpoint you can’t even see them. All the lines appear perfectly smooth, all the colors blend into each other with no wave patterns. This is similar to what happens when we bring our mindfulness cycle up to speed and smooth our transitions between the stages of being fully aware of this place in this moment, retreating back into our mind to process it, then returning to awareness again. How hi-res is your mindfulness? Are you returning to the clarity of this moment once a day? Once an hour? Every minute? How about every breath?